A romantic couple cuddles in a Chicago alley way at night for their engagement photos. Eunjin and Matt are the very definition of a sweet couple. I was very happy that they chose The Chicago Sessions as their engagement photo package. This highly stylized session features a half day spent roaming the city cuddling, kissing, and enjoying the unpredictability and endless backdrops that the windy city provides. I shoot in color and then turn them all into film like black and white images. To see more of these sessions, please visit the Chicago Sessions gallery page. For Eunjin and Matt's romantic walk around Chicago, I decided to split the photos with some late day pictures combined with night photography. For today's sneak peek, we will concentrate on the night time shots. Consider night photography for your engagement photos for a unique look. Even if you do a local session, we have many old downtown areas in Northwest Indiana that would work well. A cute couple poses on the streets of Chicago for a close up engagement portrait with street lights of the city in the background. Matt proposed to Eunjin on a bench inside Millennium Park, so going to Chicago really made sense for them. As the sun began to set, I made sure to get some close up portraits and take advantage of the streetlights that were beginning to turn on all around us. While walking Michigan Avenue, car headlights filled up the magnificent mile for another ambient city backdrop. A couple gazes at each other on Michigan Avenue during their engagement photo session as night begins to fall with car headlights as the background. 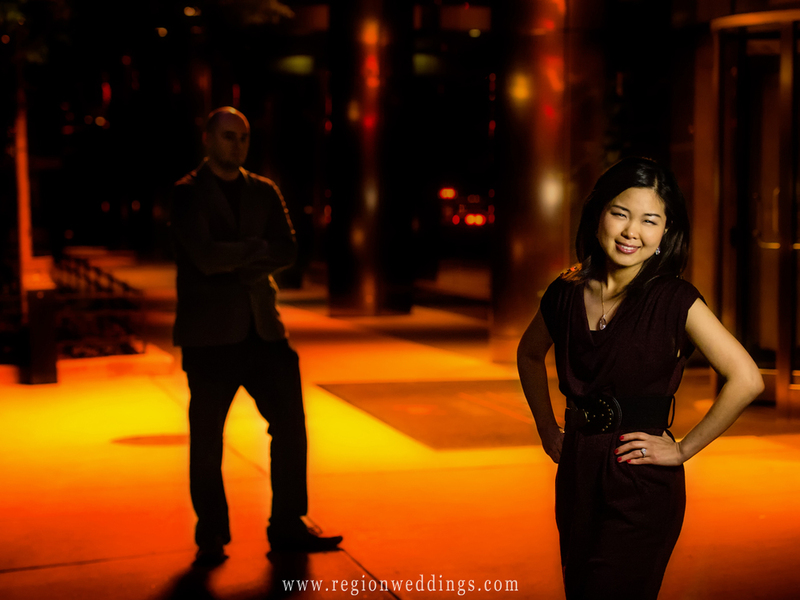 A beautiful asian woman poses for an engagement photo at a Chicago hotel entrance while her fiancé looks on in the distance. We began to make our way down State Street to catch the return train back when I spotted this median with a bench surrounded by trees, Looked like the perfect spot for our couple to cuddle up. 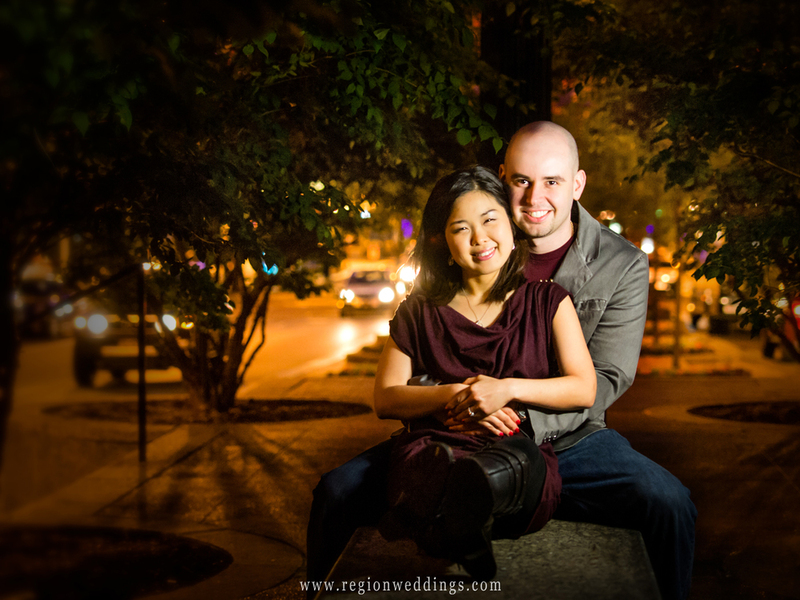 A couple poses on a bench in downtown Chicago for this romantic night time engagement photo. We took advantage of this city artwork with this fun loving photo of the happy couple blowing kissed to each other. This was our last shot before boarding the train back to Indiana. Many more images to come from this session, including the black and white versions. Stay tuned here or check in on the social media sites like Facebook listed below for more images from Matt and Eunjin's romantic night time engagement session in downtown Chicago. A romantic couple blows kisses to each other in downtown Chicago during their night time engagement photo session.